The ad that brought in a $10 million service contract. The year: 1989. The WSJ was still only running black and white content and online content was at least 10 years in the future. The story: Introduce a new Johnson Controls service business on a limited budget. World Services was a recent acquisition formerly known as Pan Am World Services. They managed facilities like Cape Canaveral Air Force/Naval Base, Kennedy Space Center, Stennis Space Center, Johnson Space Center, Los Alamos Laboratories…you get the picture. 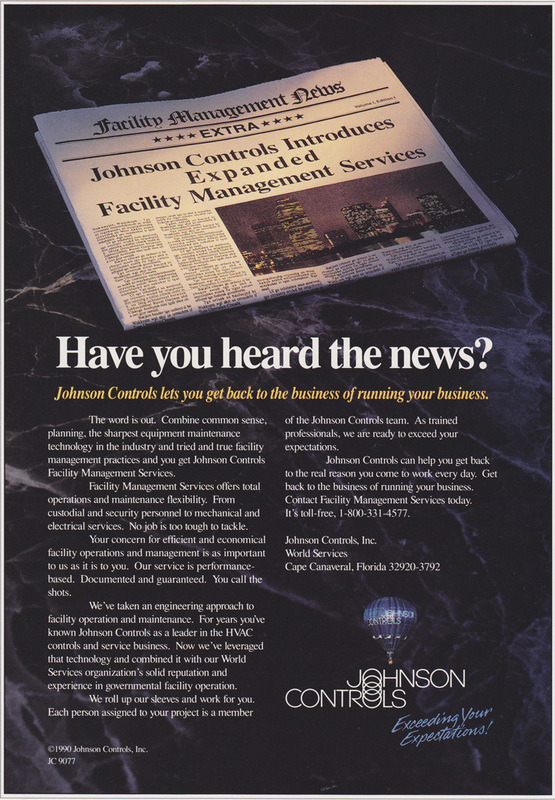 I was able to wrangle a one-time media placement as part of the overall Johnson Controls C-Suite media buy. The WJS ad hit. Several days later, I received a call from the national sales manager. They were bidding on an IBM total facilities management package. Apparently the CEO of IBM was catching up on the day’s reading, including “The Wall Street Journal,” during his train commute. He happened upon our ad…and the rest was history. The service contract set the tone for all future business. While a $10 million service contract seemed like a dream come true at the time, within two years, the business unit set a minimum of $10 million for all incoming bids. My take: This was certainly not my most visually appealing ad, but the message, the visual and, most importantly, the placement all worked together to deliver results. Marketing Commandment One: Know thy target market.